If you see a flash of blue popping up on fences around Redlands, it’s literally a good sign…a really good sign. 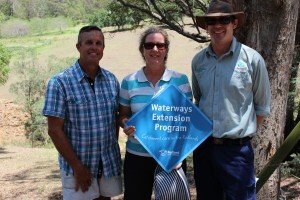 Council’s highly successful Waterways Extension Program has recently launched new signs to promote participating properties. The waterways extension program began in 2009 as a way of Council supporting people who owned properties with creeks, dams, ponds and gullies. Since then, around 80 properties have been voluntarily signed-up, equating to more than 850 hectares of land in key catchment areas. Works include bank stabilisation, revegetation, controlling pest weed and animal species and even creating floating wetlands. With more than 185 waterways projects under its belt, this program continues to go from strength to strength protecting local waterways.